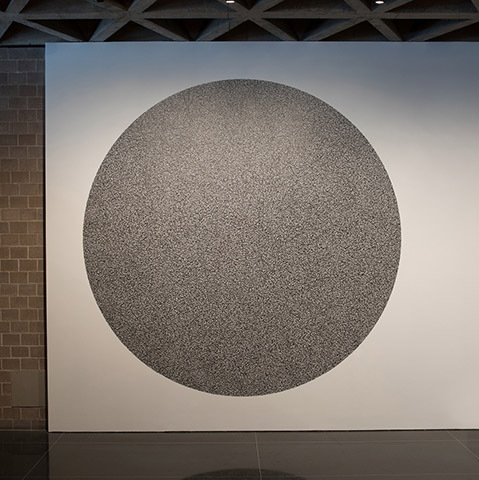 Sol LeWitt, Wall Drawing #1180, installed at the Yale University Art Gallery, New Haven, Conn., 2017. First installation: Sfeir-Semler Gallery, Beirut, Lebanon, 2005. Black marker on wall. Yale University Art Gallery, Gift of the LeWitt Collection, Chester, Conn., in honor of Terry and Richard Albright, B.A. 1961. © 2018 The LeWitt Estate/Artists Rights Society (ARS), New York. Watch a video of the wall drawing’s installation at the Gallery. Sol LeWitt Wall Drawings: Expanding a Legacy features seven wall drawings newly donated to the Yale University Art Gallery by the artist’s estate—a gift that makes the museum’s collection of Sol LeWitt’s work in this signature medium the largest in the world. The wall drawings on view represent a range of the artist’s techniques, including intricate constellations of fine graphite lines, handwritten text, and bold geometric patterns executed in colorful ink wash or crayon. The exhibition also celebrates the newly inaugurated Sol LeWitt Wall Drawing Study Center at Yale West Campus, which will house the archive of this groundbreaking artist and be an international nexus for research on his work. LeWitt first conceived of his wall drawings in 1968, and from then until his death in 2007, he created more than 1,300 of them. 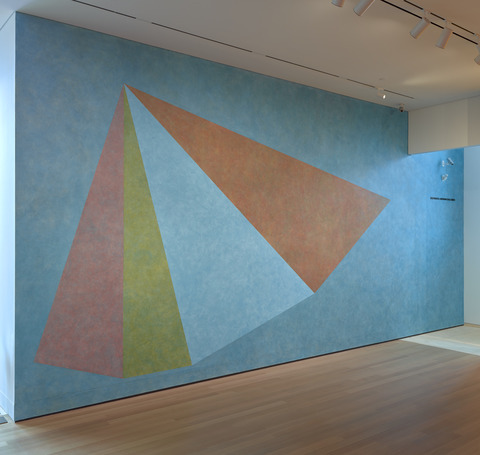 With the recent gift from The LeWitt Estate, in Chester, Connecticut, the Gallery now has 66 wall drawings in its collection. 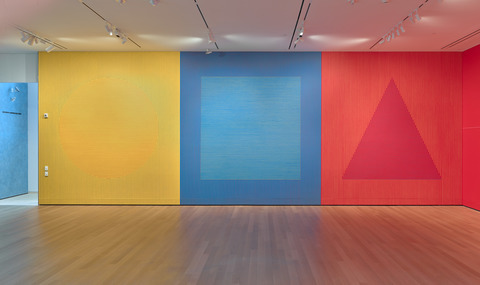 Underlying these works is the idea that the conception of an artwork can be separated from its execution: LeWitt crafted a set of simple guidelines or a diagram for each wall drawing so that others, such as studio assistants, can produce the work independently. The drawings in the current exhibition were installed by a team of 14 trained assistants, and in the case of LeWitt’s Wall Drawing #1180—on view in the museum lobby—members of the public participated in the final stages of its execution. To safeguard the integrity of this novel artistic process, the LeWitt Study Center will be responsible for training future draftspeople to execute the artist’s wall drawings, ensuring that these works can be faithfully installed for generations to come. Integral to this mission is the role of John Hogan, former studio assistant to LeWitt and since 2013 the Gallery’s Mary Jo and Ted Shen Installation Director and Archivist for Sol LeWitt Wall Drawings. Over the past five years, Hogan has led the installation of 580 LeWitt wall drawings on Yale’s campus and all over the globe, including sites in Austria, Belgium, Denmark, England, France, Germany, Ireland, Italy, Mexico, the Netherlands, Norway, Scotland, Spain, Sweden, Switzerland, and the United States. Registration required; please call 203.432.9525. All programs are free and open to the public unless otherwise noted. For more detailed programming information, visit artgallery.yale.edu/calendar. Exhibition organized by Jock Reynolds, the Henry J. Heinz II Director; Pamela Franks, Senior Deputy Director and the Seymour H. Knox, Jr., Curator of Modern and Contemporary Art; and John Hogan, the Mary Jo and Ted Shen Installation Director and Archivist for Sol LeWitt Wall Drawings. Made possible by the Joann and Gifford Phillips, Class of 1942, Fund.